A few days ago I commented on observing a black and red spider, overcoming a grasshopper many times its size. 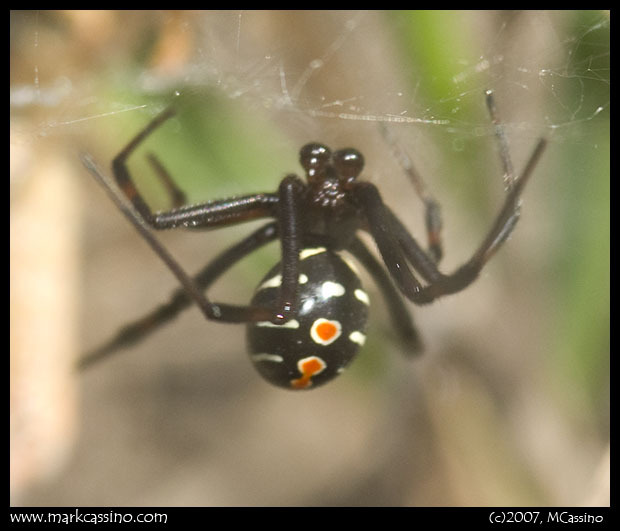 Based on the size and shape of the spider, I wondered if it was a Black Widow – but I dismissed that idea because it had yellow bands in addition to red markings, and also because the red markings did not form the hourglass shape that we associate with Black Widows. A week later I again encountered one of these shiny black spiders – this time with a dead cicada in its web. I decided it was time to identify this species. When I turned to my field guides and attempted to identify this spider, I got a bit of a surprise. While it’s not a Black Widow, it turns out that the Black Widow has a northern cousin – know as the Northern Black Spider or Northern Black Widow Spider. In fact – there are several varieties of widow spiders, apparently with similar degrees of toxicity. On the plus side – most of the material I’ve read indicates that deaths from these spiders are very rare. Some sources put the odds of fatality at only 1%. Bugguide.net has a nice collection of photos of the northern widow. It was interesting to actually observe these spiders in action. I had always wondered why these spiders had such intensely strong venom, and figured that it was just an example of randomness in evolution. After all – a spider simply has to have venom strong enough to kill prey. There is no downside to having venom far more powerful than the minimum needed, so if a species happened to evolve with super-potent venom, there would be no evolutionary pressure to move towards a weaker poison. The species would continue with venom stronger than needed, simply because it works. While one can’t draw a conclusion from just two observations – I now look at things differently. Both of these spiders were subduing relatively enormous prey. Their webs were disorganized strands of silk in the grass, but were also quite strong. Strong enough to hold a large grasshopper and cicada long enough for the potent venom to take hold. So maybe the great toxicity of these spiders’ venom is part and parcel of a much more complicated – and very specific – survival strategy. Grab large prey and subdue it fast. It would be interesting to survey a population of these spiders in the wild, and see if they rely on large prey vs. smaller insects for food. At any rate – I’m now pretty convinced that these spiders are common in some parts of the Allegan Forest. My two sightings were a week apart, but also several miles apart – the first one was in the site I call the coreopsis field, which is a clearing off 46th street, just about 1 mile north of 118th avenue. The second sighting was in the old farmstead, off 48th street and about a mile south of 115th avenue. Now that I know what the webs look like – I’m quite certain that I’ve seen several in the past few months. I can think of at least two occasions where I’ve seen large insects – once a butterfly and the other a grasshopper – trapped in similar webs in the field off 48th street. Since I first observed these spiders while lying on the ground, shooting low perching dragon flies, their presence in the fields is a little bit of a concern. While these spiders only bite as a last resort – I can easily see myself laying a bare arm on top of one while lining up a shot of a dragonfly, bee, or butterfly. I guess I should be worried – but then the odds of getting into a car accident while driving from Kalamazoo to Allegan are probably greater than the odds of being bitten by a Northern Black Widow – and certainly higher than the odds of being fatally bitten. At least now I know what to watch for, and if abdominal cramps and other symptoms settle in after a day’s shooting, I’ll know to get to the doctor as opposed to just waiting it out. And here again – the Allegan Forest has produced another interesting subject, and getting some good, clear shots of these spiders (unlike the ones shown here) will be a future project. This entry was posted by mcc and is filed under Commentary, Insect Photography, Allegan State Game Area, Allegan Forest. good luck on the good clear shot concept. that’d be a western black widow. they’re present, in great numbers, all around this town. i could walk outside right now and find 15 webs within 30 feet. problem for me is, they’re nocturnal, so in order to foto one during the day i have to seriously annoy/frighten her, then prevent her running away. i’ll figure it out eventually. they do seem to like big food. 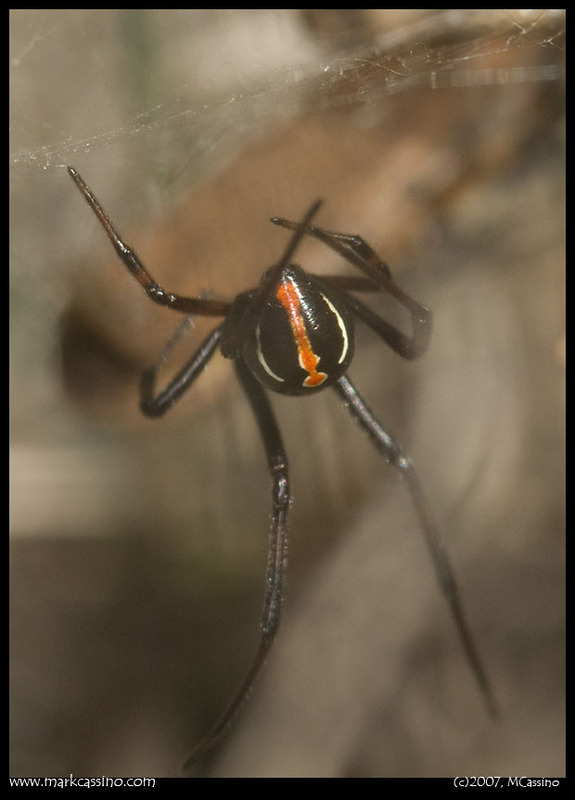 That’s a great shot of a black widow, Kim! You’ve set a standard I have to work towards. As you can see in my shot - I was shooting through a lot of vegetation that resulted in the images being pretty hazy. Thank you for displaying this page about northern widow spiders i’ve been trying to figure out what type of spider had infrested my apartment. The one I spoted was smaller and not as bold of colors though i figure it was a young one. Thank you again. I live in Southwest Georgia and we are seeing dozens of these spiders around our farm. It took me forever trying to identify them. This is the first year we have seen them, so I guess they are new to the south. Thanks for documenting them on your site. Your pictures are very good. 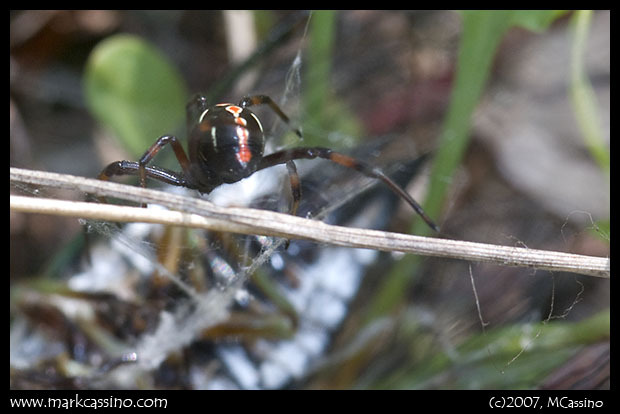 Nice pics of the Northern Widow spider. I can tell you that these little beasts live as far North as Montreal. I have seen, although not photographed, a number of specimens in the woods near my place in St. Bruno. I will be sharing the url of your site with the local paper. Hope that is ok. I emailed you - my guess would be a western widow out in Wyoming, but it’s jsut a guess. Thank you for the nice pictures of a spider I didn’t know existed. My 3-yr old son wanted to know about different spiders that may or may not live near us in Toronto (we live at the edge of the Rouge Valley park which isn’t groomed and we take many walks therein). We love the fact that this park is left as natural as possible. My son was scared of spiders until I helped him understand and look at spider pictures. Thanks for the pics. These came in handy to ID a reddish black widow that I caught in my yard in Montreal (TMR area). I wasn’t aware that they had such diverse colourings. Your link to Bugguide.net was very helpfull. These Northern Black Widow Spiders are now in Southern California, Canyon Country to be precise. My husband just saw one in our backyard. We took a picture and looked it up. Great photos btw, thanks for helping us determine what they are. I live in Va. I find many of these Spiders around our house. I figured they were just immature Black widows. Just today, I turned over a small ground level pool deck and found six garbonzo sized black widows. (scary and beautiful) Also within the same space there were several of these smaller spiders like the ones you have photographed here. One of them was in direct bodily contact with one of the larger ones. This made me wonder if the smaller ones with the back markings are male black widows. The larger ones have none of the back markings. Only the telltale hourglass underneath. I didn’t wait to see what was going on between the two in contact. I was too excited and busy coaxing all the big ones into a jar. So go figure. I wonder what I’m actually seeing. 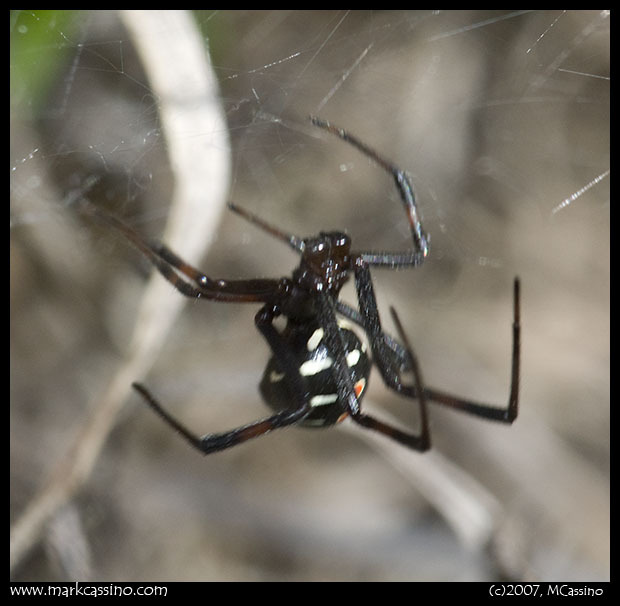 Found a tip of the index finger sized “Northern Black widow” spider, in the Ruskin area of Florida. Found dozens of them under our rotting back porch in Rockwood Ontario. Thanks for helping us identify them. Im curisous are they dangerous and if they are what should I do? I, being originally from Kalamazoo, have never seen these spiders (any widow variety) growing up, however, I now live in southern Louisiana and today after I got home from work I noticed one of these creepy crawlies making it’s web in my mailbox. Thanks for the good pics, that’s how I was able to identify what I was dealing with! i just killed one here in El Paso Texas she was large and i noticed the web was larger than a typical southern black widow. can they be found this far down south? and are they always in grassy areas or will they make their home anywhere that is cool and shady? There are four (4) types of widows spiders in the continental United States: Southern, Northern, Western and Florida Black Widows. Each has their distinct markings, mating and habitat preferences. I have a Note 4 Samsung phone. It has a light, a flash, and a zoom lens. I have some unbelievable pictures. My son-in-law is a photographer for the Army, and he just couldn’t believe the photos this camera would take. I have pics of the moon at mid-night. And the clouds are very defined. It would have been great to have had this camera when I was in Thailand. But of course, as all G.I.’s did. I bought a 35mm which took a lot to set up. This phone does all that for you. ” AND YOUR NOT SPENDING A FORTUNE ON FILM!!! ” Just take that little chip to wally-world, or plug right into your printer and download. Oh Yeah! We have Brown Widows here in SE Alabama. Sort of a milk chocolate color with the red hour glass, and the same size.